What is Berliner Weisse Beer? Berliner Weisse is a sour, wheat beer that is only produced in Berlin, Germany. Like Berlin itself you either love the eclectic, funky nature or you hate it. This brew is tart and bubbly a combination that is not for everyone, but Berliners and most Germans love it! It may take some getting used to, but we think you’ll love it as well. Also known as “Ein Rotes” (a red one), “Ein Grünes” (a green one), “Mit Schuss” (with a shot of sweet syrup), “Champagne of the North,” “The People’s Champagne” or “The Workers’ Sparkling Wine”. Berliner Weisses are known for their very low ABV% of 2.5-2.7%. Berliner Weisse beers has been brewed in Berlin since the Middle Ages. Many English speakers pronounce “Berliner Weisse” the wrong way, and say: “Burr-lin-er Whys”. Next time ordering your favourite tart, German beer, pronounce it like this: “Bear-leen-er Vice-uh”. Berlin, Germany enjoys legal protection of an appellation d’origine contrôllée like the Kölsch ales of Cologne and the Trappist ales of Belgium. Berliner Weisse is usually made from roughly 25—30% pale malted wheat, but in times past, it may have been made with as much as twice that amount. The rest of the grain is always barley malt—brownish in the old days, but pale Pils-like today. The result is a finished beer with a cloudy, dark-yellowish color. When drinking a Berliner Weisse, you can expect a light citrusy taste with little to no hope flavours. The distinct tart and sour flavours are what makes a Berliner Weisse unique when compared to other German beers. The dominating aroma of a Berliner Weisse is sour and acidic. Traditional Berliner Weisse beers often smell mildly of Brettanomyces. Berliner Weisse are a light-bodied, effervescent, almost spritz-like brew, similar to the feel of Champagne (hence it’s nickname “The People’s Champagne”). There is no residual sweetness and a low ABV%, which makes Berliner Weisse beers an ideal summer drink. What foods pair well with a Berliner Weisse beer? ‘Due to it’s light body and tart flavor crispy French Fries or other salty appetizer are a perfect match. Anything smokey or rich are definite NOs because they will overpower this light beer. 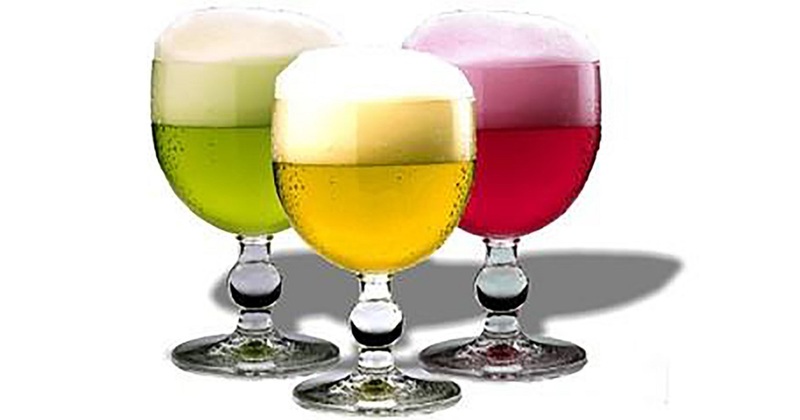 Berliner Weisse beers are usually drunk with a shot (a “Schuss”) of raspberry syrup or woodruff-flavored syrup to cut the brew’s tartness. Add the shot first and then pour the beer over it. This tart German style brew is best served in a wide-rimmed, bowl-shaped chalice, about twice the size of the bottle, because Berliner Weisse foams like champagne.